For the legal concept, see adduction (law). Adduction is a movement. 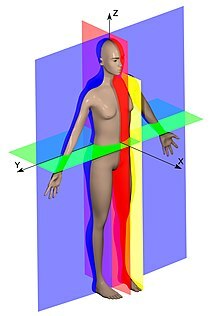 It brings a part of the anatomy closer to the sagittal plane of the body. It is the opposite of abduction. Scallops have a central adductor muscle. It lets them open and close their shells. It is quite large and developed compared to other bivalves because they swim a lot. ↑ "Arm and shoulder articulations". Retrieved 2011-08-15. ↑ "Wrist Articulations". Retrieved 2011-08-15. ↑ "Finger Articulations". Retrieved 2011-08-15. ↑ "Thumb Articulations". Retrieved 2011-08-15. ↑ "Hip Articulations". Retrieved 2011-08-15. ↑ "Foot Articulations". Retrieved 2011-08-15. This short article about science can be made longer. You can help Wikipedia by adding to it. This page was last changed on 3 March 2016, at 16:41.